Our Blenders best suitable for Materials mixing and blending products , The octagonal shape blenders best suitable for Cosmetic products , Ceramics , Animal feed, Pain color, Pharmaceutical, API bulk drugs, Pharmaceutical, Food, Chemical, cosmetics, ceramics, pesticide, plastics and other Allied industries. Our Octagonal blender machine with latest updated designed with Highly efficient dry mixing of granular products with Capacity varies between 100 LTR and 000 litres – mixing of free-flowing powders. Special Design is cGMP – Current Good Manufacturing Practices Compliance..
“A” type rigid structure of the machine with two sides resting of product container. Offering many different model and customer is find with different name like octagonal blender, pharmaceutical octagonal blender, industrial octagonal blender, steel octagonal blender, stainless steel octagonal blender, pharma octagonal blender, automatic octagonal blender, STD octagonal blender, GMP octagonal blender, chemical octagonal blender, octagonal blender, pharmaceutical octagonal blender, octagonal blender manufacturer, pharmaceutical octagonal blender supplier, octagonal blender manufacturers, pharmaceutical octagonal blender manufacturer, octagonal blender exporter, pharmaceutical octagonal blender manufacturers, octagonal blender exporters, pharmaceutical octagonal blender exporter, octagonal blender supplier, pharmaceutical octagonal blender exporters, octagonal blender suppliers, pharmaceutical octagonal blender suppliers, octagonal blender wholesale, pharmaceutical octagonal blender wholesale, wholesale octagonal blender, wholesale pharmaceutical octagonal blender. The Octagonal Blender is a very popular and precise blending machine for meshing and lubrication process of dry granules equivalently. At least more than half of the volume of the Cone Blender is filled to ensure proper mixing. We are Octagonal Blender Machine Supplier which gives best result for granules due to a constant speed and octagonal shape. It can be used for Pharmaceutical, Food, Chemical and Cosmetic products etc. We, Octagonal Blender Machine Supplier in Mumbai supply blender in which the granules comes from all sides due to the octagonal shape of the product container. 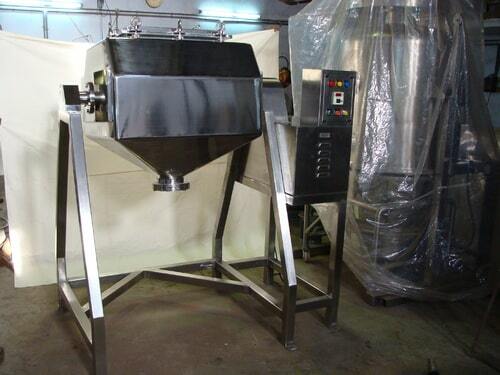 This Octagonal blender is suitable mainly for crystals and granules. We, an Octagonal Blender Machine Supplier, provide sufficient continuous movement due to their shape. Also, slow movement results in good quality of blending. We, Octagonal Blender Machine Supplier are available with Octagonal Blender that meshes even larger volume of components. Designed to perfection these octagonal machines are compact in size with a V shape and double cone blenders. We, Octagonal Blender Machine Supplier supply product that are eagerly and desperately demanded in the global market owing to its less power consumption, low speed blending and well balance in higher capacities. We are a prominent Octagonal Blender Machine Supplier for Chemical Industry. These compact size blenders ensure uniform performance and top functional efficiency. We utilize top components to manufacture these Blenders and guarantee long processing life and consistency of our devices.